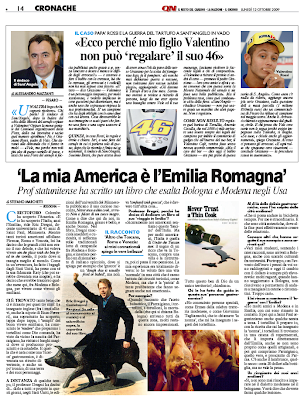 The first Italian review of Minnesota author Eric Dregni's Never Trust a Thin Cook and Other Lessons from Italy's Culinary Capital appears on Page 14 of today's Il Resto del Carlino, a newspaper based in Modena, Italy. The title: 'La mia America e l'Emilia Romagna': Prof statunitense ha scritto un libro che esalta Bologna e Modena negli Usa. Its English translation: " 'My America and the Emilia Romagna': U.S. prof has written a book that exalts Bologna and Modena in the U.S."
Read the entire review in Italian here or get the English translation here.